Chateau / Country House3928 sq. ft.
Casa Andrago, a luxury villa and three Casitas for up to twenty people. Finca La Asmoladora is a beautiful old property surrounded by 16 hectares of terraces of almond, olive, vine and orange: a superb property in a spectacular location with panoramic views of the mountains. 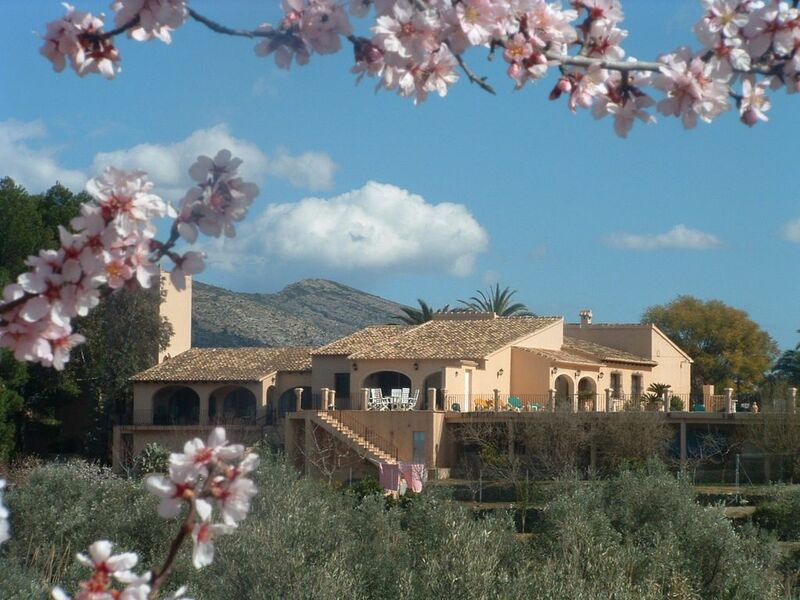 It is a haven of rural beauty, tranquility and tranquility near the unspoilt village of Parcent - "paradise among mountains" - but only 30 minutes drive from the famous family resorts of Javea, Denia and Moraira. The finca is designed to accommodate groups of 2 to 16 people in Casa Andrago, a superb five-bedroom house sleeping eight, and in three charming Casitas, each sleeping two or four. Extra beds / beds are available for the finca can accommodate up to 20 people. A small fee is charged for each extra bed provided. All the apartments of the finca are arranged around a pretty stone paved courtyard and a walled sculpture garden. Casa Andrago consists of an interconnected guest house and tower, each accommodating four people, which can be rented separately. The finca is ideal for groups of all sizes who want to vacation together and is a beautiful and beautiful place to celebrate a special event - wedding, money or wedding, brithday sigificant or birthday etcetera. The House and Casitas of La Asmoladora are superbly equipped and are available for rent individually or in combination. This allows very flexible accommodation for couples, families or large groups. All guests have equal access to the very large pool, barbecue and tennis court, but, as the property is extremely large, different groups can share the finca and easily maintain their privacy. The large stone-paved courtyard, the vast walled sculpture garden, the stone-paved terraces behind the Casitas and the huge swimming pool and barbecue terrace offer a wide choice of places to eat and drink outdoors. The stone paved courtyard has been used by many groups for cocktails. The pool / BBQ terrace is great for music and dancing in the evening and fine in the night. The nearest neighbor is over 250 meters away, so loud music for the parties is no problem. The finca has hosted many weddings, gold and silver weddings and innumerable birthday party. A renowned chef of local pueblo / regional dishes is available to prepare paellas etcetera for guests at the finca. The region's vineyard products are worth taking - the small Parcent vineyard supplies the Spanish royal family. After a glass of still wine and some almonds from the almond trees of the finca while watching the sun set dramatically behind Parcent, there are memorable restaurants of all types to try in the area. The historic cities of Valencia and Alicante are only 75 minutes away. Beautiful walled sculpture garden containing many rare flowers, plants, shrubs and trees. Very large areas of oranges , lemons, olives, almonds, pomegranates, vines, etecetera. Lovely stone paved courtyard and walled sculpture garden. Also very large tiled pool and barbecue terrace. Fans provided during the summer months. Air conditioning available in all bedrooms at extra cost. À l'écart du tourisme de masse, la finca a permis à notre très grande famille (20 résidents, plus de 25 pour les repas) de passer de très bonne vacances et de découvrir la région. La piscine, le terrain de tennis et les casitas individuelles ont eu du succès auprès des nombreux ados. La tranquillité de l'endroit entouré d'arbres fruitiers a fait le bonheur de leurs parents qui cherchaient un moment de repos. Et Derek et Penny ont tout organisé pour que chacun se sente en vacances. Paiements ou en euros ou en livres sterling equivalents.